Tessenbyo literally means a steel wire line and refers to a sharp line of uniform width. It is a typical type of line used in Japanese paintings. Lines constitute a key element of Japanese paintings, forming the framework of a painting. In contrast to the use of shading in Western paintings, Japanese paintings mainly rely on contour lines indicating the shape of objects for representation. Lines drawn using a brush can be wide, narrow, long, short, sharp, soft, fast, slow, streaky or smudged to produce various expressions. Tessenbyo is often used for kotsugaki (outlining) prior to coloring. 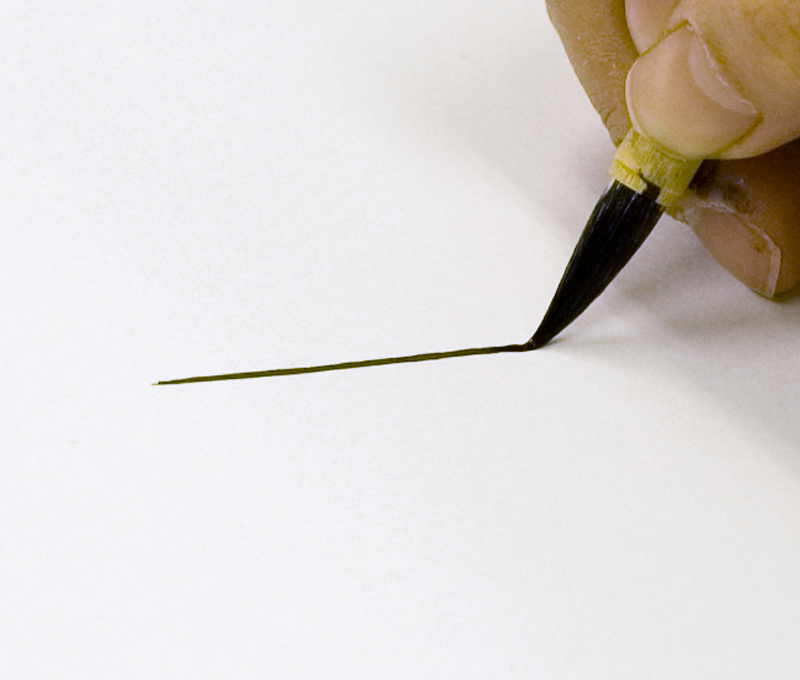 Line drawing brushes such as sakuyofude with a fine tip are used for this. The brush is prepared by loading with sumi ink or paint and draining off any excess by pressing gently on the side of the palette dish. The lines are drawn slowly at a constant speed and with a uniform width, so that there are no breaks. Tessenbyo was used widely in classic works to produce pictures of Buddha and portraits, etc. The mural painting in the Kondo Hall in Horyuji Temple is a good example of this. The Bodhisattva, whose contour line is believed to have been drawn with bengala rouge, imparts an aura of grace within an air of austerity. Besides tessenbyo, other types of lines used in Japanese paintings include hisosen (modulated lines of contrasting width), yushisen (narrow, supple lines) and kingensen (narrow, firm lines like the cords of a Japanese harp).